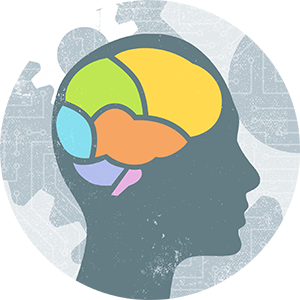 The graduate certificate is aimed to provide post-baccaulariate and Ph.D. students with a graduate-level introduction to Cognitive Science as a theory of the (human and animal) mind. Our objectives are to ensure that each student (a) be able to articulate, at least in broad terms, some of the assumptions that have been thought to unify the various subfields within the domain of Cognitive Science, and (b) be able to apply those assumptions in dealing with issues in at least one of the five core disciplines contributing to cognitive science (Biology, Computer Science, Linguistics, Philosophy, and Psychology). If the student is a graduate student (as opposed to post-bac. ), it is to be expected that the chosen discipline is that of the students Ph.D.-granting department. CGS 500 ("Introduction to Cognitive Science") will be run with the aim in mind of getting students to satisfy (a); and a (minimal) distribution requirement, together with departmental pressures on graduate students generally, will serve to get students to satisfy (b). Of the 12 credit-hours taken in connection with II, at least six must come from the offerings of a single department; and at least three must be from a course outside of the student's Ph.D.-granting department. (If the student is a post-bac., then the latter requirement is replaced by the requirement to take courses from at least two different departments.) Again, the "Introduction to Cognitive Science" course does not count as satisfying any of the distribution requirements mentioned in this paragraph. An asterisk by a course indicates that the course will count for Cognitive Science credit only on the approval of the Director of Cognitive Science. The main criterion for approval will be the extent to which the course, as taught during the semester for which the student seeks Cognitive Science credit, contains a sufficient amount of materials relevant to Cognitive Science. The Director will make this determination by consultation with relevant faculty from the department teaching the course (including the instructor of the course).